Do your students love to play games? Do you love to pair games with content? 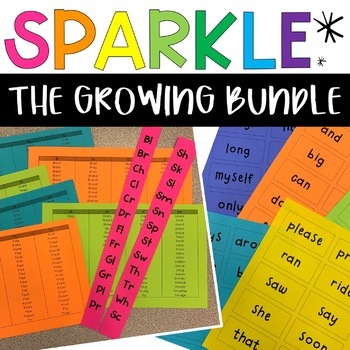 Teach your students to play Sparkle while they practice spelling their sight words. Instead of a student getting out, fine "out" students with a Sparkle Card. At the end of the game, the player with the fewest fines wins! If a student is "out", she/he marks a letter on their scorecard (similar to the basketball game, Horse). At the end of the game, the player with the least amount of letters wins! As additional products are added, the price of the bundle will increase accordingly. By purchasing the bundle at the current price, you will receive future products in this series for free!